Need an experienced roofer? Work with the ones who focus on integrity and safety. Call 480-226-4245 today for a free estimate in the Mesa, Gilbert, Chandler, Tempe, Scottsdale, and Phoenix markets. Need to replace your roof? Looking for residential roofing companies you can trust? Need an affordable roofing solution? You’re in the right place! Express Roofing is one of the most reliable and professional roofers in Mesa, Phoenix, Scottsdale, Tempe, Gilbert, and Chandler areas. Whether you need to replace your shingle, tile, or flat roof, or need foam roof restoration, we have the team to handle the project for you every step of the way. Our roof estimate process focuses on educating our customers and letting them know exactly what needs to be done before any work begins. We act as your advisor right from the beginning. You’ll be asked plenty of questions, but it’s only because we want to do the job right and make sure your roofing service is personalized to your specific needs. Personalized service: From the moment we arrive at your door, we are ready to inspect your roof to give you a detailed overview of your particular problem and our recommended solution. We won’t just give you a template of “common” problem areas and slap on a price. We create a line-by-line roof estimate that lists all of the components and details required for your project. 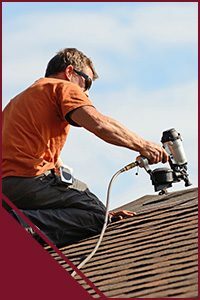 Thorough service: While other residential roofing contractors base their contracts on a square foot number, we are focused on YOU, our customer. We carry out a comprehensive inspection of your roof and check for existing problems. You will know exactly what needs to be done before any work is performed. As your acting advisors, we strive to educate our potential customers and answer any of your questions or concerns. This will help you stand back and make an informed decision. We stay away from pressured sales tactics. Instead, we base our estimates on the facts and how we can install a long-term roofing system for you. We always strive to deliver affordability and add value for our clients. Long-term results: Your home is your most valuable asset. You can’t rely on a band-aid service, such as a patch job or roof over. You can’t afford not to be proactive, as every roof has a specific service life. That’s where Express Roofing comes in. We focus on long-term applications and recommend installations over simple repairs. Enjoy greater peace of mind with professional residential roofing installations that ensure your safety and comfort. Call us today at 480-226-4245 for your free estimate. We perform roofing services in the following Arizona cities: Mesa, Chandler, Ahwatukee, Fountain Hills, Gilbert, Paradise Valley, Phoenix, Queen Creek, Scottsdale, and Tempe.